The other weekend we drove a mere two hours down to the Swiss border and then another hour(ish) to reach Interlaken, our destination. I've lived in southern Germany for almost three years and had yet to drive to Switzerland. Why? Because I figured Austria has plenty of beautiful alps and lakes and is probably less touristy and much cheaper than Switzerland. To be honest, cost was really the bigger hindrance for me. I like a good deal, and the country of Switzerland is not in the business of providing deals to tourists. Switzerland also uses the Swiss Franc, and while generally the exchange rate is 1 to 1, the actual numbers to purchase things are much higher (as in a Starbuck's coffee will cost you 8-10 Swiss Francs, depending on what you order). I guess luckily for me, I had just gotten back from a trip to Scotland where everything is really expensive for the American and their measly dollar. $22 for a meal...for one person, no problem! So in comparison, Switzerland didn't sound so expensive anymore. I may have cried a little over how much was spent in less than two weeks of travel, but let's not dwell on that. For me and my husband who like to not worry about budgeting too much on vacation, Scotland was tricky. Many mainstream pubs had drinks for about 4.50 pounds. The exchange rate is currently roughly 1 pound = $1.85, which is over $8 for a pint. Three pints later and you're already $25 deep, ouch! Anyway, we found that Interlaken was a bit cheaper than Scotland. Just a bit. Once we were in Switzerland I discovered something that's not readily available in guidebooks: Switzerland as a country loves tunnels. I don't think we saw too much of the countryside because every other minute we were traveling through a longer tunnel than the last one. Only when we approached Interlaken did we drive up and around the lake, finally being able to take in the views. It's absolutely a smart move on their part, but just unexpected. We only had a few days, and had rented out a room at place called B&B Finel, a lovely bed and breakfast overlooking one of the lakes. There are two lakes and in between is the town of Interlaken. We stayed in a town called Leissigen which was about a 10 minute drive away from Interlaken. Around the lake are many towns, and also nearby is the famous Lauterbrunnen which can be found on many Pinterest pages. Our B&B was high up on a hill and we had to drive through many switchbacks just to arrive at our destination. But once we reached the place there were views overlooking the lake and mountains all around. I loved the quiet and the cool mountain air coming through the windows at night, and they had a restaurant and a large patio as well. If you like peace and tranquility, this is a place to look into staying at when you visit. Switzerland's sheer beauty did not disappoint. The mountains were stunning and the lakes were so incredibly green and clear as well. I honestly don't think I've ever seen lakes so green before. Below are photos of Lauterbrunnen. We saw a few guys base jumping where they landed a few feet from us. There are TONS of waterfalls, and the snowcapped Jungfrau Mountain sits high above all the other mountains in the area. It's really beautiful and highly recommended if you're going to Switzerland. From Interlaken you just drive about 10 minutes to arrive in this valley. We also checked out Interlaken and walked around the main street area. There were a LOT of tourists and way more Americans than I was expecting. I never realized what a tourist destination Switzerland is, doesn't everyone know it's ridiculously expensive?! How do all these 18-something's afford this?! Anyway, I digress..... And of course, there were hoards of buses filled with Asian tourists ready to take photos. I've only ever seen these groups walking around taking pictures, and always wonder if they shop or eat or do anything else. If you've never experienced what I'm talking about just visit Neuschwanstein, Switzerland, Salzburg, etc. and you'll quickly see what I'm talking about. Below you can see the 'landing strip' where paragliders (that's me too!) ended up. The main street has a Hooter's, which I thought was really random, and in case you haven't picked up on the theme it was just about the most expensive Hooters ever (we did not eat there I promise, just checked the menu!). And, as the title suggests, I was able to cross off a 'bucket' list item of paragliding in Switzerland! I hope this gave you some inspiration to visit the area. 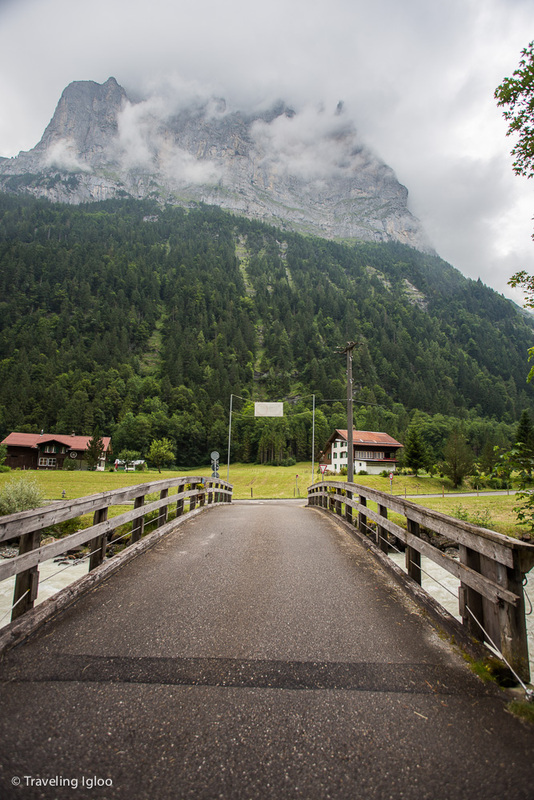 I would suggest staying away from Interlaken and checking out the smaller towns to avoid the tourists if you can. The prices will also most likely be a bit cheaper too. There is a nice little Irish pub when you are entering the town, though, and the food is pretty good and prices are decent (for Switzerland).